In May, Nature Publishing Group and California State University announced a three-year partnership to use $49 e-books for certain Biology classes over a more expensive and less versatile paper book. Soon, state universities in Texas and Florida will follow suit. While there are hundreds of startups pitching various ways to bring e-textbooks to universities, Nature's initiative is one of the first widespread e-textbook programs to come from the publishing industry. In its 135 years in the publishing business, this is Nature's first attempt at a textbook. It is not attempting to fall in line with the outdated textbook publishing model, but instead has redefined textbook publishing for the digital generation, so texts can be cheaper, more interactive and customizable, and more up-to-date. "Our goal is to create a new frontier for the industry," said Vikram Savkar, Senior Vice President and Publishing Director at Nature Publishing. "One that isn't based on an idea of antagonism between publishers and learning institutions, but a collaboration between both sides that works well, and answers the needs of the two." Savkar was at Pearson publishing for most of his career, and created the Education Division at Nature just a few years ago. In his time at Pearson, he published lots of textbooks, and knows the ins and outs of the industry and why interactive e-books are the answer to many of its problems. Why are textbooks so expensive, and why won't e-books be the same? "The business model behind textbooks is completely out of step with what the market today wants," Savkar said. "On the demand side, the attitudes have changed so much that the old business model simply does not resonate with buyers any more." The result is that people for the last 20 years have been buying products that don't give income to publishers in a meaningful way. The successful used book trade, and organized book sharing programs among students, for example, have caused publishers to jack up prices. "At this point, a textbook is basically priced for three students under the assumption that they'll sell you a textbook once, and you'll sell it to two of your peers: one next year, and one the year after that," Savkar said. "So I need to sell it to you for the income I need to make from three years worth of students." Savkar says it's a gross oversimplification that drove textbooks to where they are today. Publishers assume they're only going to make money on a book once every three years. Because of this, quite a lot of tension developed in the market between publishers and the people who were buying their products. "What it needed was a reset, and that's what we're trying to do," Savkar said. Nature is working to construct a business model that really resonates with both the faculty and the students, and part of that means delivering a digital experience that students don't feel is only marginally useful, or something that contains a lot of information they don't need. With Nature's "Principles of Biology" e-textbook, instructors can customize the book every time they use it, and everybody who uses it will use a slightly different version, so students will always get exactly what they need. Also, there are no material costs in e-textbooks. By taking out the cost of printing, they can offer it at a lower price point instantly. Since the text is written specifically for a digital format, it includes flexible usage rights. Students can print their book if they want, faculty can remove content they don't want to use, or even modify information and share it with the students in their class. All these activities, Savkar said, have been sources of tension for publishers under the traditional business model. Instead of giving one or two lead writers five years to write a textbook, Nature has spread the task of writing to more than 50 scientists, science writers, and teachers who are experts on the subjects that the book covers. Their content then gets funneled through a small editorial staff who give the book a single, unified voice and vision. This has dramatically sped up the time-to-market cycle for the creation of totally new texts, and with digital updates, there is no need to rewrite the entire book. "There are certain aspects we've preserved from the traditional textbook creation model because they're crucial and frankly wonderful," Savkar said. "For example, the quality control process. This has been exhaustively reviewed by scientists and instructors. That's something we haven't changed and really should never change, it's the essence of what makes textbooks so reliable. It's the reason why instructors don't just write their own books." "The core [review] activity is still done in a very old fashioned way where people sit down and read and compare notes and scientific papers, so that is still a very traditional activity. That's one of the things we didn't want to change." 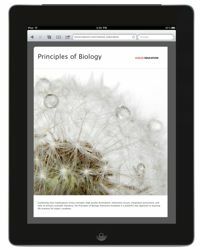 Nature's first digital textbook "Principles of Biology" will be released to the public on September 1, 2011 and will cost only $49.